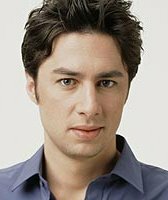 Born in South Orange, New Jersey, on April 6, 1975, Zach Braff began acting at an early age. When he was 11, his parents enrolled him in an upstate New York theatrical camp called Stagedoor Manor. (The camp has produced a number of well-known actors over the years, including Jennifer Jason Leigh, Robert Downey Jr. and Natalie Portman.) The camp allowed Braff to hit the ground running in the acting world, as he was spotted by a talent manager and was soon regularly going on auditions. Braff’s first role came when he was 14, in a TV pilot for a show called “High,” where he played opposite Gwyneth Paltrow. The show never made it to the air, but three years later Braff caught a good break, landing the part of Woody Allen’s son in 1993’s “Manhattan Murder Mystery.” The film was popular with critics and audiences, and Braff’s appearance gave him wider visibility. The following year, Braff starred in the TV movie “My Life as a Girl,” but he soon took a break from acting to attend Northwestern University’s film school in Chicago. Before graduating with a bachelor’s degree, he wrote and directed a number of short films, giving him experience that would lay the groundwork for later writing and directing duties. Braff returned to acting in 1999 with a lead role in the independent film “Getting to Know You,” and a string of roles in films such as “Endsville,” “Blue Moon” and “Broken Hearts Club” followed in 2000. What followed the next year, Braff likely never saw coming. He was cast as Dr. John “J.D.” Dorian, the main character on the new medical comedy series “Scrubs.” The show was an instant hit, proving to be Braff’s big break and launchpad to fame. The show began airing in fall 2001 and left the air in spring 2010, making Braff a household name along the way. He developed his behind-the-camera skills on “Scrubs” as well, directing several episodes and serving as the show’s executive producer in its final seasons. “Scrubs” also allowed him to exercise his creative impulse for filmmaking, and in 2004 “Garden State,” a film he wrote, directed and starred in, was released. The film debuted at Sundance and was nominated for the Grand Jury Prize in the Drama category. Braff soon moved on to leading roles in films such as the animated “Chicken Little,” “The Last Kiss” and “The Ex”; did voiceover work for video games in the Chicken Little and Kingdom Hearts franchises; and appeared on other TV shows, such as “Arrested Development” and the “Scrubs” spinoff, “Scrubs: Interns.” As his career advanced, the movie roles became more frequent, and 2013 proved to be a big year for the actor. He landed the part(s) of Frank/Findlay in the blockbuster megabudget “Wizard of Oz” prequel, “Oz the Great and Powerful.” The film made $80 million its opening weekend and provided Braff with yet another platform for his acting chops. Do you want to hire Zach Braff? Directly request a quote. In 48 hours we can send you the availability of Zach Braff If you would like to book Zach Braff, Entertainment Booking Agency is the right place. We will offer you the best price and contact the management or we directly contact Zach Braff. For corporate appearances or speaking engagements you can contact our agents and the will help you true the process. Tags: hire Zach Braff, Zach Braff booking, book Zach Braff, Zach Braff appearances, find more information on booking Zach Braff for appearances, Zach Braff speaking engagements, Zach Braff endorsements/spokesperson, Zach Braff appearance fees, Zach Braff booking agency contact info, biography of Zach Braff, Contact an artist booking talent agent find a speakers bureau that can book Zach Braff, speaker booking agency for Zach Braff, Zach Braff booking agency, Zach Braff booking for corporate event. EBA is one of the biggest entertainment booking agencies in the World. We book hundreds of celebrities, artist, athletes and speakers in a year. Important to know is that we are not claiming to be the management of Zach Braff. We are not the official agent for Zach Braff. Companies from around the globe book these artists and speakers true our company be course we have one of the biggest networks and we always have direct contact with the artist or the management. We help you to find the right celebrities for your corporate of private events. Please contact one of our agents to get free advice and we will help to get the world-famous artist on your party.